These limited edition slot-together Baby Zaishu seat/table combinations are created by Zaishu Studio from the company’s off-cuts and spare ink. 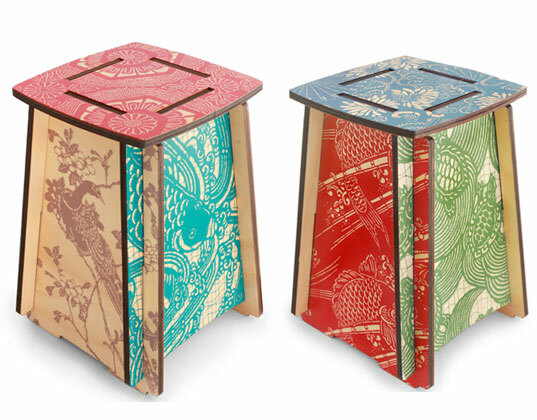 Each seat/table features silkscreen artwork patterns from 16th century Japan, which is hand printed with water-based inks and varnishes. The New Baby Koi & Kimono seat/tables are perfectly sized for a child, and when outgrown, they may be used as quaint decor throughout the home. Made with sustainable Native Australian Hoop Pine plywood. Unique slot together, lightweight yet strong design that can be shipped flat to save space and assembles in minutes without tools, nails or screws. Made and ships with a minimal carbon footprint. Safe water-based inks and varnish used for all products. Each Zaishu seat comes packaged in a reusable non-bleached calico bag sewn by women at a local disability workshop. Zaishu seat/tables have been independently certified by GECA as a Good Environmental Choice product and give the maximum allowance of points toward a 6 green star rated interior by the Green Building Council of Australia. If you miss getting one of these beautiful limited edition seats for your tot, keep in mind that Zaishu makes adult sized pieces that will work as a table for your little one as well. These limited edition slot-together Baby Zaishu seat/table combinations are created by Zaishu Studio from the company's off-cuts and spare ink. Each seat/table features silkscreen artwork patterns from 16th century Japan, which is hand printed with water-based inks and varnishes. The New Baby Koi & Kimono seat/tables are perfectly sized for a child, and when outgrown, they may be used as quaint decor throughout the home.